This ‘sense’ is not to be obtained by reading between the lines (for there is nothing there, in those white spaces), but by reading the lines themselves. We like books that have a lot of dreck in them, matter which presents itself as not wholly relevant (or indeed, at all relevant), but which, carefully attended to, can supply a kind of ‘sense’ of what is going on. No tale ever happened in the way we tell it. But the moral is always correct. Doubt is a necessary precondition to meaningful action. Fear is the great mover in the end. 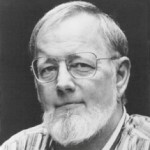 Donald Barthelme was born in Philadelphia, Pennsylvania. He was an American author, novelist, and professor. He also worked as a newspaper reporter for the Houston Post, was managing editor of Location magazine, director of the Contemporary Arts Museum in Houston. He is a professor at various universities. He produced four novels characterized by the same fragmentary style: Snow White, The Dead Father, Paradise, and The King.